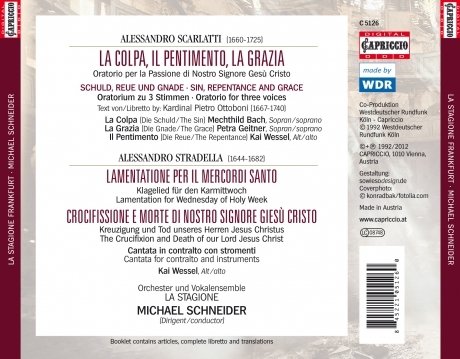 outstanding musical events: Here, within an interval of four days (from the Wednesday to the Easter Sunday) were performed two oratorios in which a remarkable amount of the most elaborate effort had been invested and which reflected sequentially the Passion and the Resurrection: the Passion oratorio composed by the Italian "doyen" Alessandro Scarlatti was followed by the "Resurrezione" by G.F. Handel, the young, talented 23-year-old Saxonian genius. Whereas the "Resurrezione" has found some new acclaim following the Handel renaissance, Scarlatti's oratorios, like all his vocal works (apart from a few uncharacteristic exeptions), has fallen into oblivion. This full-length work is among Scarlatti's most mature compositions and is certainly the most representative example of the type of passion music cultivated in Italy. This genre is based on a totally different conception to that of Bach's passion music. His stylistical language was typical and had a determining influence on the period between the early baroque style of Monteverdi, Cesti and Cavalli and the development of the "galant" style of his pupil J.A. Hasse which leads directly into the classical period.